Portsmouth Sail Training Trust’s 29 foot safety launch Falcon is back on the water thanks to an incredible effort from a team of companies and individuals who donated their skills and services to get her back afloat. Following accidental damage in late 2015, Falcon was off the water, causing a big setback to the PSTT’s valuable work. Falcon is PSTT’s safety launch and supports more than 80 young people from disadvantaged areas in Portsmouth as they learn to sail and row and gain a variety of marine and other vocational qualifications. As part of the restoration, Trafalgar Wharf stepped in to provide free storage space for Falcon. “There was a fantastic community effort by a number of companies and the Royal Navy all working hard to get Falcon back into ship-shape,” said Jonny Boys, Managing Director of Trafalgar Wharf. 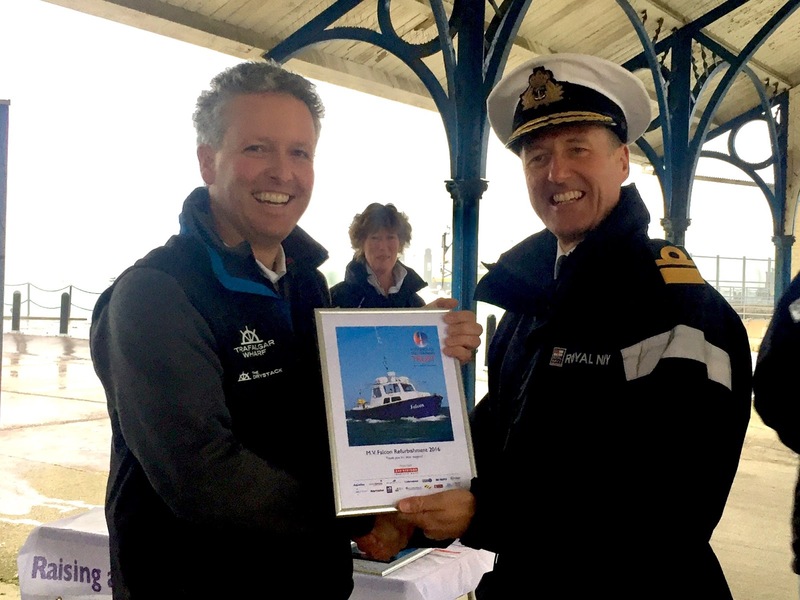 Rear Admiral Paul Bennett presented a plaque celebrating her restoration to Alan Dorricott, BAE Systems’ operations lead for Fleet Time Engineering. The presentation was attended by representatives from the restoration team and many of the companies involved in the project.